Kele, then what was the American Civil War all about? Slave labor did not build the infrastructure of this country. The modern infrastructure of this country began during the Industrial Revolution, after slavery had been abolished in the United States. The abhorent practice of enslaving human beings was mainly confined to the southern states, particularly cotton and other crop plantations. Slaves worked in the fields or in the homes of plantation owners, not as builders of modern infrastructure. I don't for one moment discount the contributions of peoples of ALL colors in building the modern framework of this country. However, it was not built upon the back of slavery. I see now that others have also drawn this to your attention, Kele, and that you have responded to them. Perhaps illegal immigrants are not slaves in the broadest sense of the term; however, it is true that American industry has for decades taken advantage of the fact that these immigrants will work the worst jobs for far lower wages and less labor rights, while the American government has conveniently turned a blind eye to the whole affair. I agree with you 100%. This is indeed the fault of our government for allowing the modern day enslavement of any particular geo-political group of people. It is not only allowed, but encouraged by a government whose pockets are lined with the dollars of these corporations which insist upon cheap labor. My fight against illegal immigration is not only for the sake of Americans, whose livelihoods are being destroyed by the cheap labor base available as long as the tide of illegal immigration is not stemmed, but for those who are freely allowed into this country illegally to replace American laborors. My antipathy toward illegal immigrants who refuse to assimilate and who have an attitude of entitlement, along with a revisionist historical outlook of reconquista, is balanced by my empathy for those who are being exploited in this country by big business which insists upon slave labor at the expense of all concerned. If they are granted amnesty and begin to demand fair treatment in the workplace, they will also be replaced by a new crop of cheap, illegal alien labor. Amnesty is not the answer. ChooseBlackAmerica.org was not allowed their 1st Amendment right to assemble and speak freely against the illegal invasion of America. Ted Hayes, the event organizer, was granted a permit to assemble in Leimert Park but that didn’t happen. Instead the LAPD gave the park to illegal aliens and their anarchist and Communist supporters. The LAPD pushed American citizens up on the sidewalk, roped them off in yellow police tape, and refused to let them have access to the park. 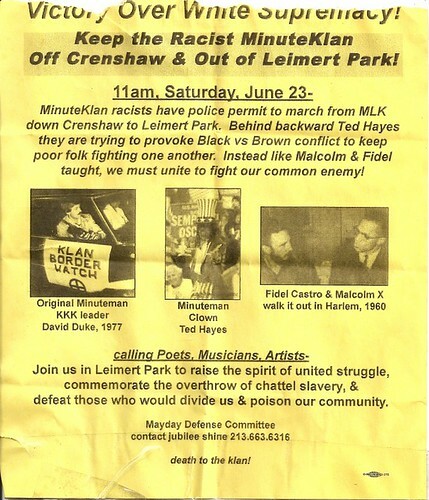 Here is the flyer the opposition seeded the neighborhood with before we arrived. I was too upset last night to write much about this event, but more photos, video and dialogue to come. Yesterday in Lost Angeles, CA - the L.A.P.D. allowed themselves to be cowed by mob rule and the rule of law in Lost Angeles took it's final dying gasp. There is no rule of law in Lost Angeles, California--only anarchy. Be afraid America. Be very afraid. I find the last line on the flyer to be outright criminal - are they not legally liable for instigating others to carry out a death wish? What the heck is going on here? Kele, I agree 100% with you, too; your view on this matter is very balanced and correct. I know there are some here, but they are few and far between...there is no landscaping or fruitpicking enterprises here, just a few places to work, very small place and not many well paying jobs, and even the poorer people do well, they keep their homes up nice, have good work ethics and are not on welfare, people here are rather rare in my opinion, there are some young punks that is everywhere no escaping that, thankfully they are few and far between and do not live in my nice neighborhood. I really have no sympathy for illegal aliens. No one is forcing them to come here, and they can leave any time that they want to. I really think it is such a poor waste of time to protest in American streets while they should be doing the same thing in their own country. I read the Victor Davis Hanson book (Mexifornia) this past weekend. I highly recommend it to any and all interested parties.